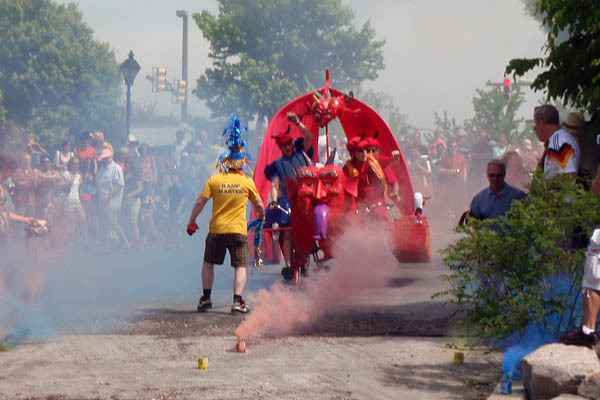 Going to Hell brought smoke to lend a brimstone look (but not smell) to their water entry. This was an update of 2009’s Going to Hell entry with a new welded frame, larger head, and large purple tongue. Here, the Ramp Master completes his inspection of the sculpture from Falls Church, Virginia. 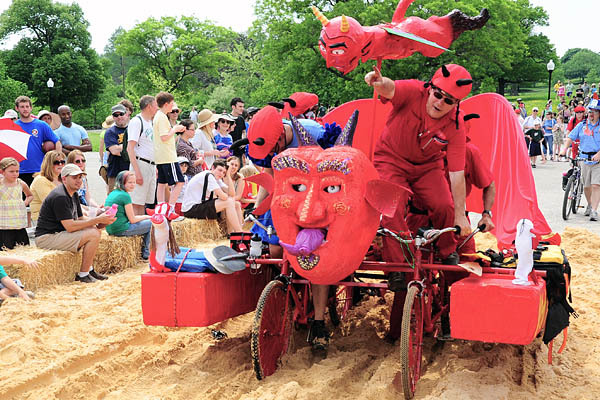 Here they made it through the sand—but only by standing on their pedals in the posture characteristic of those lacking the low gears necessary for effective sand propulsion. Until Patterson Park, the sculpture was almost always in the lead, and was on track to win the Speed award. Unfortunately, they suffered another mechanical breakdown between the sand and the mud, and dropped out of the race. Last year, they had a similarly successful opening two-thirds of the race, followed by a similarly catastrophic end. For their repeat performance, this year they received the Golden Dinosaur award for the most memorable	breakdown. They were piloted by four devils—one in a blue dress. 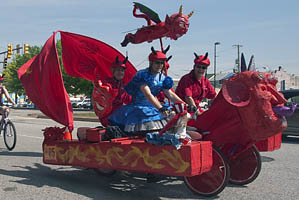 All sported red horned helmets—showing that even a simple addition to a bicycle helmet can provide a significant extension of a sculpture’s theme. 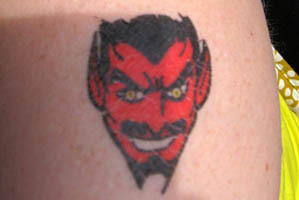 They gave out excellent bribes consisting of devil temporary tattoos. Marking spectators and race officials with tattoos is a superb bribe, much better than commercially packaged candy that many teams provide to Kinetic Kops citing them with race infractions. 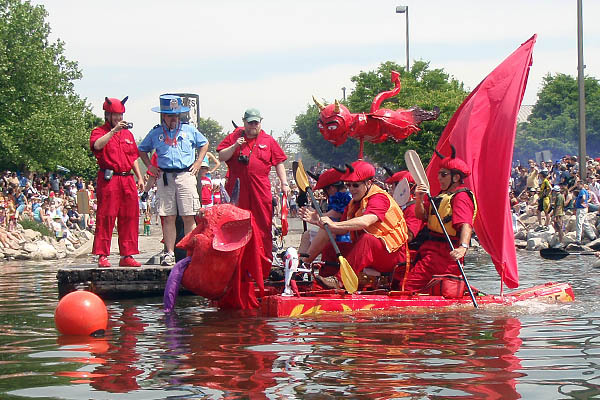 They performed well on the water as their demon flew overhead. However, their pontoons being mostly underwater indicate that if the wind had risen or the sculpture’s weight shifted, they might have rapidly capsized due to the Pontoon Effect. Remember that effective pontoonage ensures that each of two pontoons is capable of providing buoyancy for the entire sculpture’s weight.